Congratulations for making it this far! After you conquer today’s exercise, Pilates Leg Kick, your back and core should already be in a much better condition then before you started this program. These erector spinae exercises are essential to anybody who tends to sit a lot. By implementing our stretching routine, you’ll strengthen all the muscles that support your spine, improving your posture and making daily activities that stress your back a breeze. If you’ve had a spinal or back injury, consult with your doctor before you start the program. Please make sure to take your time with each exercise before progressing further down the order. This ensures you avoid injuries and tackle each exercise already prepared. Initial position. Lie on your stomach and leaning on the arms, lift the upper torso. The forearm should be placed so that the angle between the shoulder and the body was about 90 degrees. The hands are clenched into fists and touching each other. Legs are extended and closed, toes slightly pointed. Exhale: in the same energetic movement straighten your leg at the knee, bending the other one and going for the buttocks. Repeat the exercise 20 times (10 per leg). Keep the movement of the feet locked in the knee joints. The body, however, must remain stable and motionless. Pilates Leg Kick has an important place in our stretching program. It is a very useful exercise for strengthening the stability of the back muscles. The erector spinae extensors hold the body of the mat with some additional support from the arms. 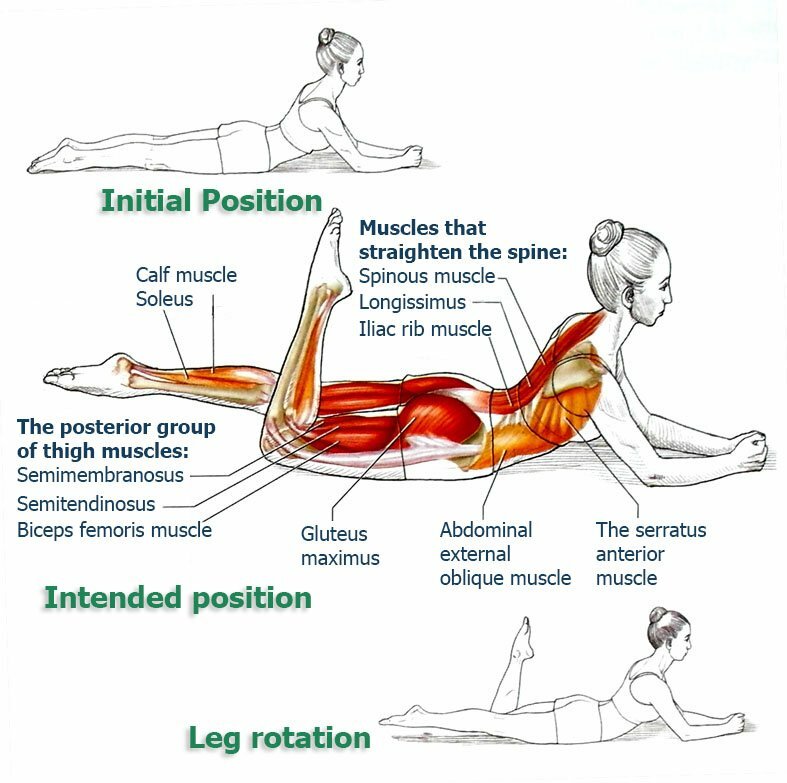 The movement of the feet is aimed at trying to challenge this stability and simultaneously improve tone and endurance of the back and thigh muscle groups, which is necessary not only to keep the feet in the air, but also to bend the knees. As with the previous erector spinae exercises, the abdominal muscles play an important stabilizing function, limiting the forward tilt of the pelvis and avoiding hyperextension of the lumbar spine. This is a crucial skill you’ll find invaluable for the more complex exercises later in this program. If you feel discomfort in your back, limit the extension of the erector spinae by moving your elbows a little further forward with the head resting on the hands. On the other hand, if you place your elbows just below the shoulder joints, you’ll increase the extension of the spine and give the back and abdominal muscles a bigger load (which means extreme caution should be exercised).